I made this amazing Senegalese-inspired vegan dish while visiting my parents a couple weeks ago and I couldn’t wait to share it with you! This may have been the first time they ever truly (and purposefully) enjoyed eating vegan. 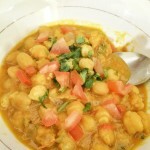 The chickpeas were stewed in a turmeric-rich peanut and coconut stew, a truly delicious experience. Hope you enjoy! A protein and nutrient rich vegan stew of chickpeas, coconut milk, peanuts, ginger & turmeric! Warning!! This recipe is exceptionally easy and delicious but you do have to plan in advance 🙂 Trust me, it's worth it! The reason is this recipe uses fresh, dried chickpeas rather than the canned version. The taste and texture is amazing, not to mention all the amazing nutrients are salvaged from avoiding the canning process! **However, if time is limited, please do feel free to use canned peas! It is still a healthy, QUICK and delicious option! In a large bowl, add the 2 cups of dried chickpeas and 6 cups of water or enough to cover the chickpeas by 2 inches. Let chickpeas soak overnight, about 6-8 hours. Drain but do not discard any excess water. This same water can be used to cook the chickpeas. We are not losing ANY thing! In a medium pot, boil the soaked chickpeas with the soaking water, Add a bayleaf and cook for 40 minutes or until cooked through but not too soft. In a large dutch pot or wok, heat the olive oil until hot then add the chopped onion, scallion, garlic and ginger. Season with salt to taste then add the chopped tomato and let simmer for about 3 minutes. Add the turmeric and stir (I use fresh turmeric root whenever I can but the powdered is just fine!). Add the can of coconut milk and stir well. Add the peanut butter, lime juice, salt and pepper and stir well. Let simmer for 5-7 minutes to allow flavors to combine. If too thick, feel free to add a little water to loosen. Soup should be rich but not too heavy. Add cilantro, adjust seasoning with salt and pepper and enjoy! Feel free to top with chopped tomato, onion, peppers, spinach or any fresh vegetable of your choice! Chickpeas/Garbanzo Beans: Great source of Dietary Fiber (Great for colon health), Folate and other trace minerals! Coconut Milk: Vitamin and mineral rich! Vitamin C helps to boost immune system while fat-soluble vitamins E &B provide energy metabolism. Garlic, Onion & Ginger: The holy trinity of West African Cooking! Antioxidants, Minerals galore! Turmeric & Cayenne: Anti-inflammatory, aids increased metabolism, improves blood circulation and overall heart health!